This high stepping gourmet dish is great for special company or just something ‘throw together’ to impress your friends and family. Preheat the oven to 375 degrees. Melt the butter in a small saute pan over medium heat. Add the shallots and saute until softened, stirring continuously, about 5 to 8 minutes. Spread the shallots over the bottom of the partially-baked tart crust, set aside. Put the goat cheese in the bowl of a food processor fitted with a steel blade. Pulse 3 to 4 times. Add the cream, egg, salt and pepper and run until smooth. Remove the blade from the bowl and stir in the pesto with a wooden spoon. Pour the mixture over the shallots in the prepared tart shell. Place the pan on a baking sheet and bake for 30 minutes or until the filling is firm. 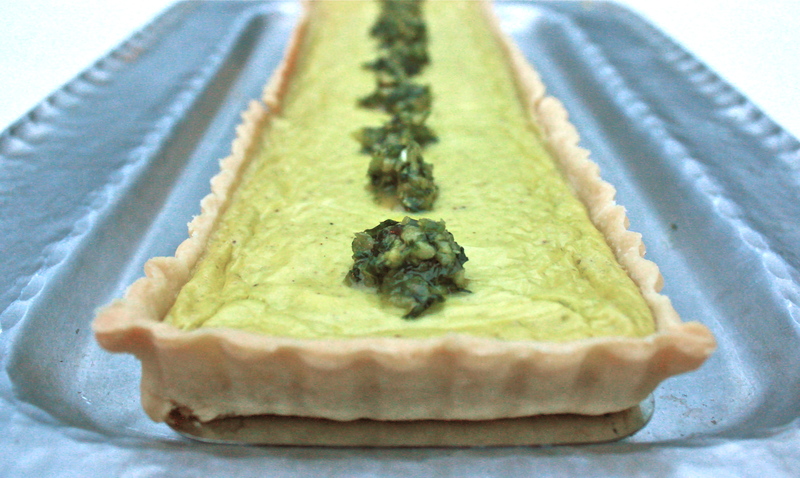 Allow to cool slightly and top with dollops of pesto.